Background: A growing number of mobile health (mHealth) technology-based apps are being developed for personal lifestyle and medical health care support, of which several apps are related to pregnancy. Evidence on usability and effectiveness is limited but crucial for successful implementation. Objective: This study aimed to evaluate the usability, that is, feasibility and acceptability, as well as effectiveness of mHealth lifestyle and medical apps to support health care during pregnancy in high-income countries. Feasibility was defined as the actual use, interest, intention, and continued use; perceived suitability; and ability of users to carry out the activities of the app. Acceptability was assessed by user satisfaction, appreciation, and the recommendation of the app to others. Methods: We performed a systematic review searching the following electronic databases for studies on mHealth technology-based apps in maternal health care in developed countries: EMBASE, MEDLINE Epub (Ovid), Cochrane Library, Web of Science, and Google Scholar. All included studies were scored on quality, using the ErasmusAGE Quality Score or the consolidated criteria for reporting qualitative research. 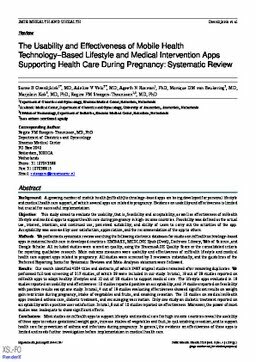 Main outcome measures were usability and effectiveness of mHealth lifestyle and medical health care support apps related to pregnancy. All studies were screened by 2 reviewers individually, and the guidelines of the Preferred Reporting Items for Systematic Reviews and Meta-Analyses statement were followed. Results: Our search identified 4204 titles and abstracts, of which 2487 original studies remained after removing duplicates. We performed full-text screening of 217 studies, of which 29 were included in our study. In total, 19 out of 29 studies reported on mHealth apps to adopt healthy lifestyles and 10 out of 29 studies to support medical care. The lifestyle apps evaluated in 19 studies reported on usability and effectiveness: 10 studies reported positive on acceptability, and 14 studies reported on feasibility with positive results except one study. In total, 4 out of 19 studies evaluating effectiveness showed significant results on weight gain restriction during pregnancy, intake of vegetables and fruits, and smoking cessation. The 10 studies on medical mHealth apps involved asthma care, diabetic treatment, and encouraging vaccination. Only one study on diabetic treatment reported on acceptability with a positive user satisfaction. In total, 9 out of 10 studies reported on effectiveness. Moreover, the power of most studies was inadequate to show significant effects. Conclusions: Most studies on mHealth apps to support lifestyle and medical care for high-income countries reveal the usability of these apps to reduce gestational weight gain, increase intakes of vegetables and fruit, to quit smoking cessation, and to support health care for prevention of asthma and infections during pregnancy. In general, the evidence on effectiveness of these apps is limited and needs further investigation before implementation in medical health care.